Tian'anmen (天安门 Tiān'ānmén) is the centre of Beijing and the Chinese world. Capital city buildings surround Tian'anmen Square, while the Forbidden City was the Imperial capital for hundreds of years. This precinct is the most famous area in all of China. Tian'anmen Square (天安门广场; Tiān'ānmén Guǎngchǎng) is one of the largest squares in the world. 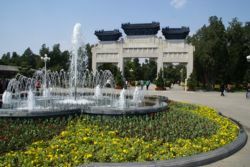 Built for Mao to impress; the square is surrounded by Soviet-style monuments and government buildings. Tian'anmen Square remains an astounding place and a spot to linger and see visitors from all over China, many visiting their capital for the first time. There is a flag raising and lowering ceremony at dawn and dusk at the north end of the square. There are four marble lions in front of the Tian'anmen gate, the southwest one has a bullet hole on its stomach from the 1989 Tian'anmen Square massacre. The square is best reached by subway. Qianmen Station on Line 2 is at the southern end of the square, while Tian'anmen East and Tian'anmen West, both on Line 1, are at the northern end. Due to traffic restrictions, taxis cannot stop on the square, so if you come by taxi, the driver will have to let you out on a nearby side street. You must pass through compulsory security check to enter the square. The district is served by the wider Beijing public transport network. The main subway stations are Tian'anmen East and West on Subway Line 1. Subway Line 2 runs south of Tianan'men Square and the nearest station is Qianmen. This page was last edited on 23 April 2015, at 10:12.